The Capitol Steps are on Instagram. Visit us for recent performance photos and more. Or even follow us, if you dare. The Capitol Steps perform every week in Washington, DC and around the country. We have public shows coming up in California, New York, Pennsylvania, and Washington, DC. Read more... and see exactly how we can be in so many places at once! You can get inside info on North Korea from Dennis Rodman, or you can get it from us. 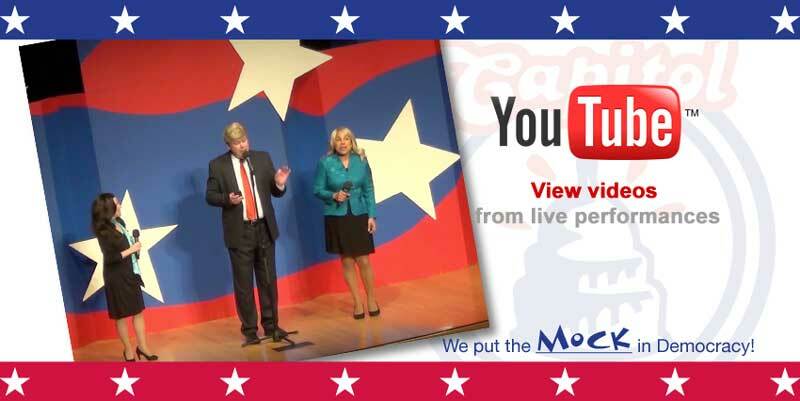 See scenes from live performances on our YouTube channel. "The Capitol Steps will have you and your date rolling with laughter — perhaps even across the aisle." Read this recent review on DatingNews.com. Save money by attending as a group! Discounts for groups of 10 or more are offered for the Reagan Building performances in Washington, DC! 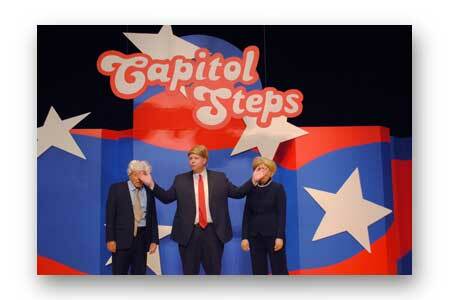 "Capitol Steps make politics fun again" — review from The O'Colly. "A machine gun of comedy" — review from DC Theatre Scene. 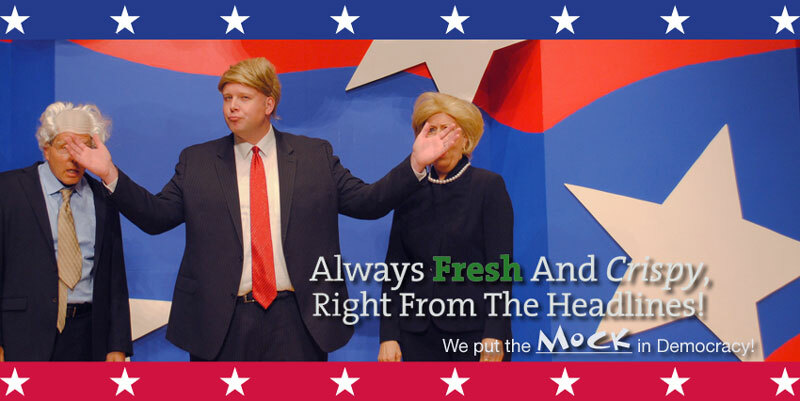 "Outrageously funny" — Suffolk Center for Cultural Arts. "Great place to go on a date...Fair and balanced." — review from DC Metro Arts. How are the Capitol Steps like the Trump Administration? Read a CityBeat interview with co-founder Elaina Newport about how songwriters and performers keep up in these fast-paced times. Another successful fundraiser with the Capitol Steps as the entertainment! Take your date to a Capitol Steps show! Dating expert Amber Brooks says it offers a bipartisan "heaping helping of romance on top of the laughs." Read her review and her advice for couples on mixing comedy, politics, and romance. Our name was taken from a racy Washington scandal of the time we began, in 1981. Just recently, former congressional wife Rita Jenrette spoke out and denied the legend, 30 years later! We're sticking with her original story. Sign up for our mailing list to hear about upcoming events and albums. Paul Ryan's legacy (among so many other things!) includes the major tax cut that you can see for the first time in the returns due today. It fits on a postcard and it pays for itself, too. 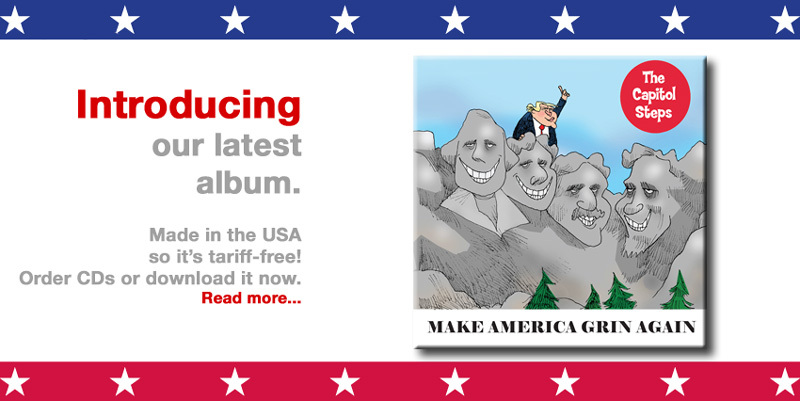 From the album Make America Grin Again (2018). Herman Cain is a strange choice for the Federal Reserve, unless President Trump wants interest rates at 9.99%, a return to the gold standard, or just someone to swap harassment stories with. 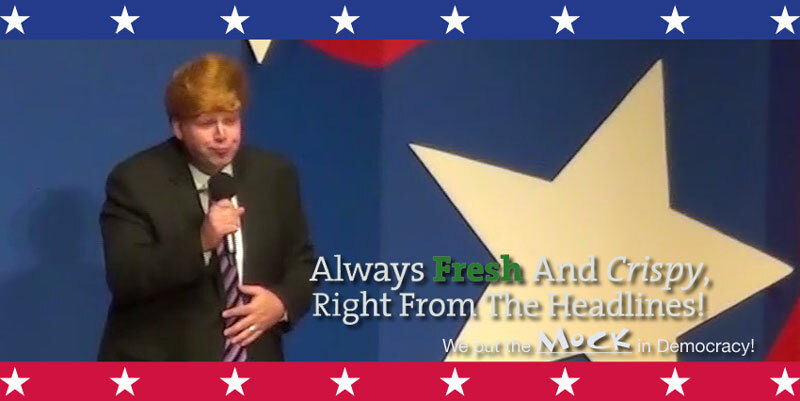 The former pizza CEO and failed 2012 presidential candidate turned down an earlier Trump offer to be ambassador to Ubeki-beki-beki-stan-stan. See live performance video on YouTube. 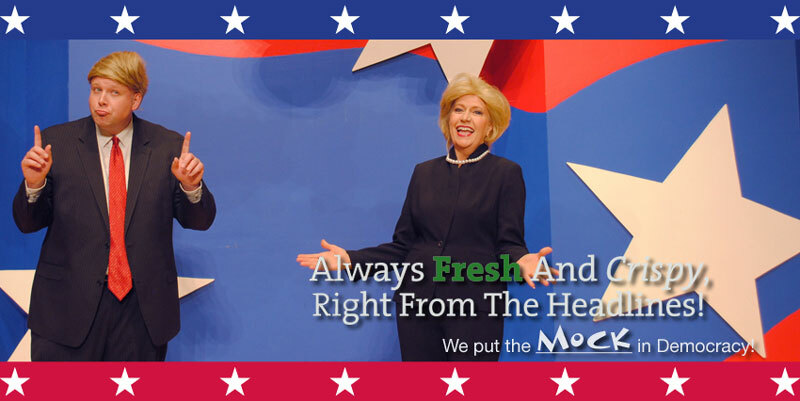 From the album Take the Money and Run For President (2012). Facebook is facing a new federal lawsuit accusing it of giving advertisers tools to discriminate by limiting or blocking which potential renters or buyers can see a given property. The Trump administration is adamantly opposed to housing discrimination, so it's got its top man on the job, HUD Secretary Dr. Ben Carson. Robert Mueller's report is finally in! And it's a big win for President Trump: "No Collusion, No Obstruction, Complete and Total EXONERATION!" (Well, almost.) It's a big win for Russia, too. Mueller found no evidence that anyone else in the Trump campaign conspired or coordinated with Russia's internet operations to influence the 2016 election. Which is what Putin has been saying all along. See live performance video on YouTube. Facebook celebrated the one-year anniversary of the Cambridge Analytica data harvesting scandal with even more scandal. And outages. And a plan to completely change everything users expect from Facebook. Democrats have a crowded field of candidates. They just keep coming! For New Hampshire voters, it means a lot of new names and faces to keep straight. For President Trump, it means facing his greatest challenge yet: coming up with nicknames for all of them. The president roused the right last week with his record-long, wild and rambling speech at the Conservative Political Action Conference. For well over two hours he kept Republicans enthralled and fact checkers working overtime. See live performance video on YouTube! Bernie Sanders raised a record-setting $6 million dollars within a day of his announcement of his 2020 presidential campaign. He's the only current Democratic candidate who has run for the office before, and he knows just how to stand up to the current administration. President Trump's emergency declaration is "not unique." He says his predecessors "declared many national emergencies. Many, many." And that's actually true! So of course he's expecting their continued support, especially on Presidents' Day. Site created and produced by Moose Hill Bitworks. Recordings and lyrics Copyright © by Newport and Eaton. (Recordings and lyrics prior to 2007 Copyright © by Strauss, Newport & Eaton or by Strauss & Newport. This work includes parodies of the original songs. All rights reserved, including the right of reproduction in whole or in part in any form. These audio files are provided for individual listening only. Do not redistribute. 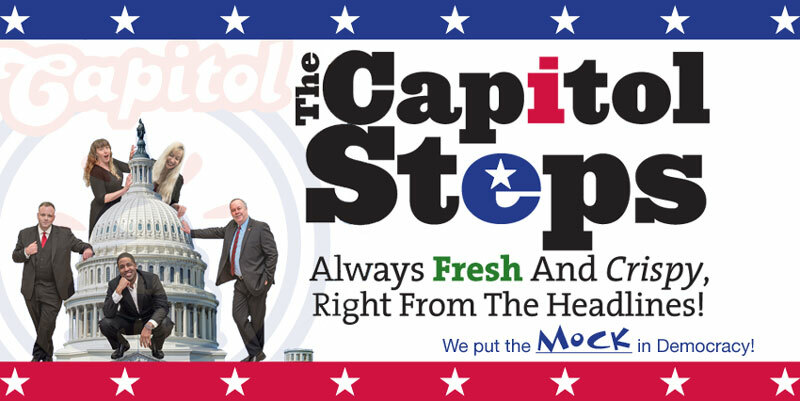 Interested in hiring the Capitol Steps for a private event? Please call us at (703) 683-8330 or inquire on-line: visit our contact page and select "Hiring." The Capitol Steps are a member of the National Tour Association. 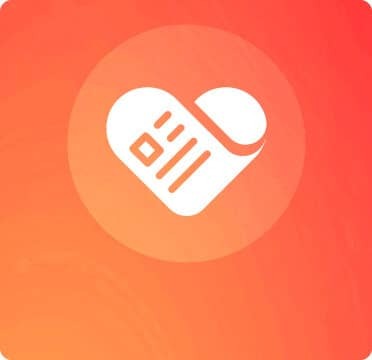 We welcome your comments and questions, but please read the FAQ first.